Jim Benes of Countryside, Ill., topped a field of 455 to win the $750,000 first-place prize and an Eclipse Award as Handicapper of the Year at the 14th annual Daily Racing Form/NTRA National Handicapping Championship (NHC) Presented by Treasure Island and Sovereign Stable Saturday afternoon. The 50-year-old Benes, a professional horseplayer, amassed a winning score of $268.40 from 28 mythical $2 win-and-place wagers and two mythical $4 win-and-place “Best Bet” wagers over the two-day tournament held at Treasure Island Las Vegas. Benes, who qualified for the NHC at Hawthorne Race Course, was in second place at the conclusion of Day 1, and stayed at or near the top of the pack throughout Day 2. Going into the NHC’s final race—Race 10 at Santa Anita—Benes trailed eventual runner up Roger Cettina by $2.40. His $2 win and place bet in that final race was on favored Hidethegoodstuff, who finished second to Hail Mary and returned $3.60 to place—enough to secure a final winning margin of $1.20 over Cettina, a Rumson, N.J., native, who receives $200,000 for his second place finish. Total winnings this weekend for Benes, including a $4,000 Day 1 bonus he received for registering the second-best score on Friday, were $754,000. Jeff Hartz of Runnells, Ia., finished third at $244.00 to collect $100,000. Richard Grose of Wentzville, Mo., was the Day 1 leader, and faded somewhat to finish fourth with $242.60. He will take home $75,000. Dan Comoro of Tigard, Ore., rounded out the top five at $196.00. That score was good for $50,000. 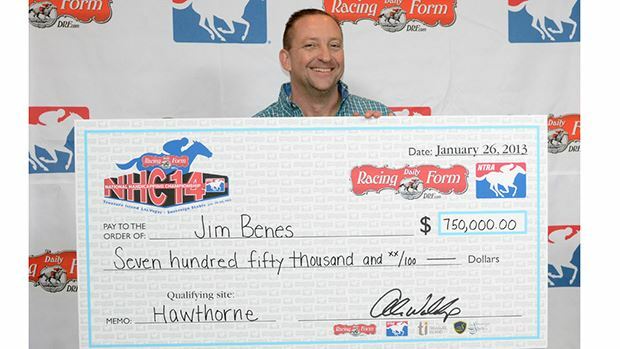 The NHC 14 finals paid out to the top 40 finishers from a total purse of $1,500,000. Including $295,000 paid out to top finishers in the year-long, $295,000 NHC Tour, the aggregate payouts this weekend to contestants totaled $1,795,000, plus travel and hotel awards. The highest finish among the eight previous NHC winners at this year’s event was recorded by NHC VI champion, Jamie Michelson, who checked in 78th. No one has ever won the NHC more than once in the event’s 14-year history. By virtue of his victory, Benes also automatically earns an exemption into next year’s NHC finals. Full standings and results for this weekend’s just completed NHC can be found at www.ntra.com and www.drf.com. In its 14th year, the Daily Racing Form/NTRA National Handicapping Championship is the most important tournament of the year for horseplayers. There are no “buy-in” entries at the NHC. It is the culmination of a year-long series of NTRA-sanctioned local tournaments conducted by racetracks, casino racebooks, off-track betting facilities and horse racing and handicapping Web sites, each of which sends its top qualifiers to the national finals. More than 4,500 people signed up for the 2012 NHC Tour and participated in these local tournaments, hoping to win a coveted spot in the NHC Finals. Treasure Island will also host the “Wager to Win” tournament tomorrow, offering two berths to the January 2014 NHC.